This article was last updated on May 28, 2013 and reflects the state of Ember (1.0.0-rc4) and the latest build of Ember Data (0.13) as of that date. Fork the project on Github! In Part 1 I showed you how to setup a Rails-API app for Ember. In Part 2 I showed you the basics of building an Ember app, reading from a backend API and displaying that information. Today we’re going to do some coding on the Rails side and the Ember side to add Creating, Updating, and Destroying records. 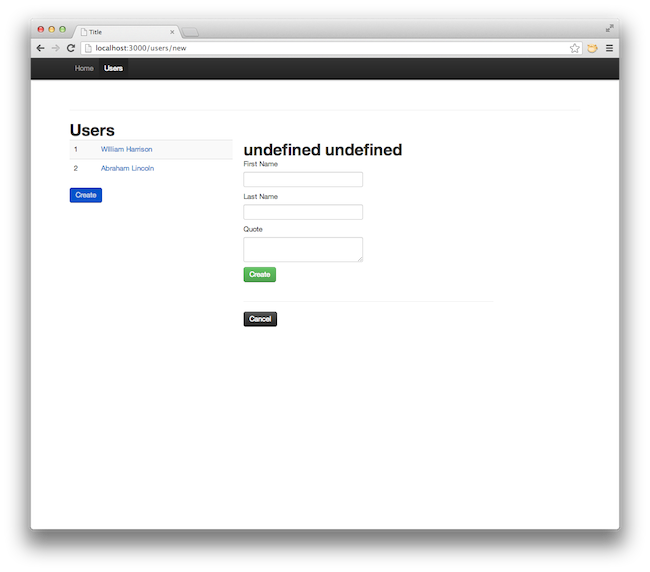 In Part 1 we setup the backend using Rails API. In Part 2 we built out the basics of an Ember app, reading from a remote data source and displaying that data. Now we’re going to add the ability to Create, Update, and Destroy that data. This part will be a mix of Ember and Rails code. We need to add the proper route so the index page doesn’t blow up. While we’re in here we’ll add the edit route as well. save will make a call to this.store.commit(). You will notice we are not modifying a model, assigning params, etc… as you would in a Rails app. Keep in mind that when you modify data that is bound in the form you are actually modifying the data in the model itself. The datastore in Ember needs to be directed when these modifications should be made “permanent”, and because we are using the RESTAdapter Ember will attempt to write these changes to the backend. cancel If the user decides to not create a new user we must delete the record we created then transition to the index page. It has been mentioned that 422 is the proper status code for validation failures. Personally I would prefer to use respond_with but it isn’t part of the default Rails-API stack, hopefully this will change. Now let’s run our app and see how it goes. Now when we add data and create it will write to the back end, take us to the show page. When can then click Back and we can see the record has been automatically added to the collection on the index page. save here because the model already has an id we can commit to the datastore and transition. cancel instead of deleting the record we want to rollback to its previous state. And we can only rollback if the record has changed. Now go through and everything should work! This allows us to treat the templates similar to a partial in Rails. The 204 status here is refers to No Content. Ember-data expects this to ensure the destroy action is a success. That’s it! You’ve just created your very first Ember app with all of the CRUD actions. Congratulations!